Rebecca Solomon, a 22-year-old college student, was passing through security at Philadelphia International Airport when a TSA worker, she says, pulled a small clear plastic bag with white powder from her bag as a joke. In the tense new world of air travel, we're stripped of shoes, told not to take too much shampoo on board, frowned on if we crack a smile. The last thing we expect is a joke from a Transportation Security Administration screener - particularly one this stupid. 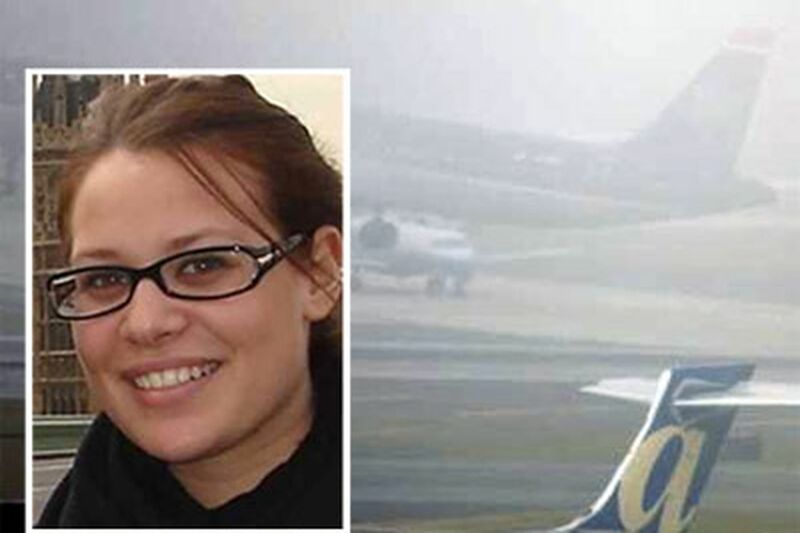 Rebecca Solomon is 22 and a student at the University of Michigan, and on Jan. 5 she was flying back to school after holiday break. She made sure she arrived at Philadelphia International Airport 90 minutes before takeoff, given the new regulations. She would be flying into Detroit on Northwest Airlines, the same city and carrier involved in the attempted bombing on Christmas, just 10 days before. She was tense. What happened to her lasted only 20 seconds, but she says they were the longest 20 seconds of her life. After pulling her laptop out of her carry-on bag, sliding the items through the scanning machines, and walking through a detector, she went to collect her things. A TSA worker was staring at her. He motioned her toward him. Then he pulled a small, clear plastic bag from her carry-on - the sort of baggie that a pair of earrings might come in. Inside the bag was fine, white powder. She remembers his words: "Where did you get it?" Two thoughts came to her in a jumble: A terrorist was using her to sneak bomb-detonating materials on the plane. Or a drug dealer had made her an unwitting mule, planting coke or some other trouble in her bag while she wasn't looking. She'd left her carry-on by her feet as she handed her license and boarding pass to a security agent at the beginning of the line. Put yourself in her place and count out 20 seconds. Her heart pounded. She started to sweat. She panicked at having to explain something she couldn't. Another passenger, a woman traveling to Colorado, consoled her as others who had witnessed the confrontation went about their business. Solomon and the woman walked to their gates, where each called for security and reported what had happened. A joke? You're not serious. Was he hitting on her? Was he flexing his muscle? Who at a time of heightened security and rattled nerves would play so cavalierly with a passenger's emotions? When someone is trying to blow planes out of the sky, what is a TSA employee doing with his eyes off the ball? When she complained to airport security, Solomon said, she was told the TSA worker had been training the staff to detect contraband. She was shocked that no one took him off the floor, she said. "It was such a violation," the Wynnewood native told me by phone. "I'd come early. I'd done everything right. And they were kidding about it." I ran her story past Ann Davis, regional TSA spokeswoman, who said she knew nothing to contradict the young traveler's account. Davis said privacy law prevents her from identifying the TSA employee. The law prevents her from disclosing what sort of discipline he might have received. "The TSA views this employee's behavior to be highly inappropriate and unprofessional," she wrote. "We can assure travelers this employee has been disciplined by TSA management at Philadelphia International Airport, and he has expressed remorse for his actions." Maybe he's been punished enough. That Solomon's father, Jeffrey, is a Center City litigator might mean this story isn't over. In the meantime, I think the TSA worker should spend time following passengers through the scanners, handing them their shoes. Maybe he could tie them, too. Update: Ann Davis, the TSA spokeswoman, said this afternoon that the worker is no longer employed by the agency as of today. She said privacy laws prevented her from saying if he was fired or left on his own.